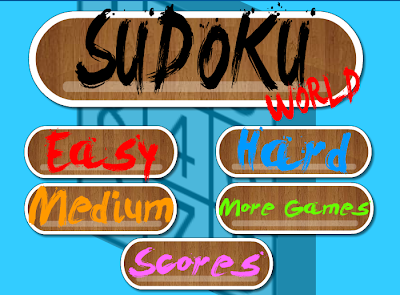 Sudoku World is a brainy game of sudoku in which you will work your brain to the fullest. has 3 different levels and world rankings. With board lightly colored to distinguish good groups. a challenge to prove you're the best player in the world. The game has 9 groups of 9 squares. in each group can only put numbers from 1 to 9 without repeating. Each number can be repeated either put in the same horizontal or vertical line of the entire board. © 2013 StarfallGamer Website. All Rights Reserved.. Simple theme. Powered by Blogger.